On 23 October 1997, at 0632 hours, coal train DR396 collided with the rear of another coal train, MT304 standing at Tarro, en-route to Port Waratah. The collision occurred in clear conditions on the up coal road, adjacent to the western end of Beresfield railway station. Both trains were operated by FreightCorp. The driver and observer of DR396 suffered serious injuries, as did a person standing on the station platform. The Stationmaster also suffered minor injuries. 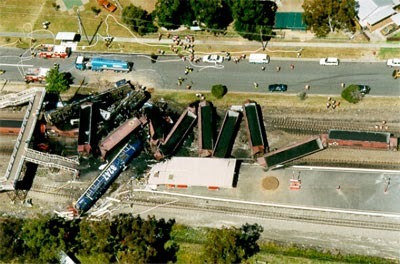 The three locomotives and first ten coal wagons of DR396 were derailed, as were the three rear wagons of MT304. Wreckage blocked both coal roads and adjacent mainlines. Beresfield station and associated structures also suffered extensive damage. Considerable disruption to passenger and freight operations resulted from the accident. The response to the emergency by local services, and rail organisations, was carried out with speed and efficiency, substantially in accordance with established procedures. Restoration of services was largely accomplished by 27 October, without further injury. The investigation found the circumstances of the accident were consistent with the crew of DR396 failing to comply with caution and stop signal indications protecting the stationary MT304. Reduced driver alertness, associated with work related fatigue, was found to be a significant factor in the events leading to the collision, together with a system intolerant of human error, and inadequate safety defences.